The oldest craft beer in the state needed to reinvigorate its 20-year-old brand to reflect a new direction for the brewery. The identity needed to breath new life into its image and connect with new audiences, promoting its move to smaller batch, higher quality brews and a more creative approach to its product. Building on the Red Brick vision to carve out its niche as the leader in Southern Craft Beer, our Creative Mischief team began creating a stronger identity through more visually impactful packaging and a new website to help build community engagement and increase product sales. 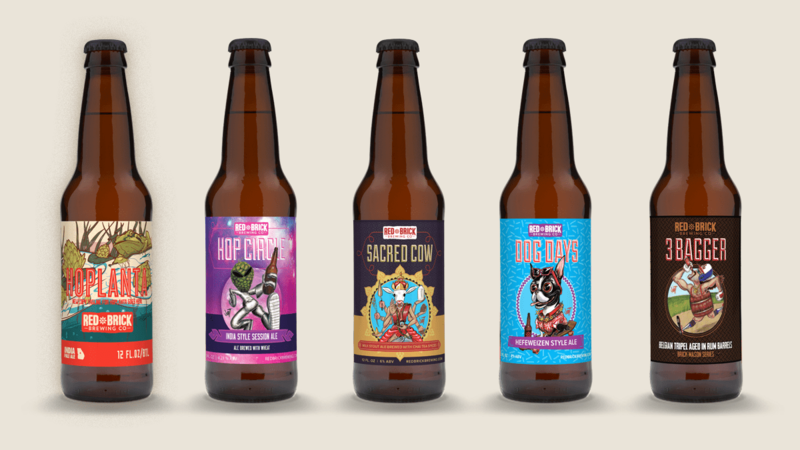 New illustrations reflected the brewery’s unique and creative approach to individual flavor profiles. At the same time, we refreshed the Red Brick label and established a distinct overall look and feel for the brand and future packaging that would connect with its audience and establish a more sophisticated, identifiable presence within the craft beer market. The new packaging and website showcases the Red Brick experience, builds community, and encourages engagement, while driving product sales. Sacred Cow, the first re-designed product released, was the fastest selling Red Brick product to-date. As we relaunched their entire product line, we continue to help with the company’s overall success as its marketing agency of record with new packaging designs, a comprehensive communication strategy, email and PR. Red Brick Brewery Profitable for the first time in their 20 year history!